An Ariane 5 rocket launches two communications satellites, the ASTRA 2F and GSAT-10, for Europe and India on Sept. 28, 2012, from a pad at Guiana Spaceport in Kourou, French Guiana. PARIS — Europe’s Ariane 5 ECA rocket on Sept. 28 successfully placed Indian and European telecommunications satellites into transfer orbit, with both satellites reported healthy and on the way to final position. 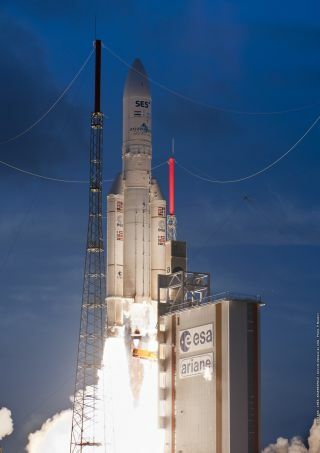 In its 51st consecutive success and the fifth of seven liftoffs scheduled this year, the Ariane 5 ECA bested its previous record for the mass of payload deposited into geostationary transfer orbit. The two satellites — India’s GSAT-10 and Luxembourg-based SES’s Astra-2F — together weighed 9,367 kilograms at launch. The adaptors and dispenser platform added slightly more than 800 kilograms, bringing the total mass separated in orbit to 10,177 kilograms. The Arianespace consortium of Evry, France, and Ariane 5 prime contractor Astrium Space Transportation are making incremental improvements to the Ariane 5 rocket. In November, European Space Agency governments are expected to decide whether to complete development of a new upper stage that would further increase performance to geostationary orbit by about 20 percent starting in 2017. Built for the Indian Space Research Organisation (ISRO), which is India’s space agency and doubles as its satellite operator and satellite services vendor, GSAT-10 weighed 3,400 kilograms at launch. It carries 12 C-band, six extended C-band and 12 Ku-band transponders, and is designed to operate for 15 years. GSAT-10 also carries a navigation payload as part of India’s Gagan GPS augmentation system. The United States, Europe and Japan have similar overlays, which validate signals delivered by the U.S. GPS constellation of satellites in medium Earth orbit through payloads on geostationary satellites operating 36,000 kilometers over the equator. ISRO said in a Sept. 30 statement that the maneuvers to bring the satellite to final geostationary position were proceeding on schedule. GSAT-10 will be operated at 83 degrees east. Astra-2F is the first of four SES satellites being built by Astrium Satellites of Europe to replace aging SES direct-broadcast spacecraft over Europe. Astra-2F, weighing nearly 6,000 kilograms at launch, is designed to deliver 13 kilowatts of power to its Ku- and Ka-band payload. It will operate at 28.2 degrees east. The Ka-band will be used as part of SES’s cautious entry into satellite-delivered consumer broadband service in Europe. The company already has some 70,000 customers using Ku-band for broadband access, and is adding Ka-band to its new Astra satellites over Europe to test the waters for a higher-speed service.